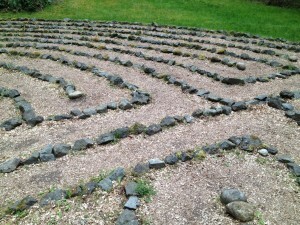 Labyrinth at the Whidbey Institute. Cascadia Climate Collaborative held a two-day climate conference at Whidbey Institute last weekend. It felt like a journey. I had a sense it wasn’t going to be a typical conference when it was kicked of by a Native American, Paul, playing an ancestral melody on a wooden flute followed by the entire audience of 80-plus people introducing themselves. Great idea! As we went around the room, I noted who I might want to make an effort to meet over the next two days. Throughout the conference we were encouraged to enjoy the surrounding woods, trails and landscaped lawns. On one of the breaks I found a labyrinth and I started to walk it when I realized – it’s the perfect metaphor for climate change and our hope to mitigate it’s effects. The answers might look straightforward enough (keep fossil fuels in the ground, use less, buy less, recycle, reuse, renewable energy, divest, eat less meat and dairy, etc.) but implementing them is going to be fraught with twists, turns and dead ends before finding our way to the center. That’s right people. One of the best comments (and there were many!) was from a participant, Chom Greacen, an energy researcher, in a breakout session. She paraphrased Matthew Huber’s book Lifeblood: Oil, Freedom and the Forces of Capital, when she said fossil fuels are intrinsic to our way of life. They have made our lives comfortable and its hard to untangle our sense of prosperity from them. Now, don’t get me wrong. I don’t think we should stick with fossil fuels but I do think we should listen to deniers and people who do not have our clear vision of the future. They have a point and unless we can speak to that point and more forward together we’ll be at a dead end. I think mitigating climate change will be a team sport. More like Outward Bound and less like a silver bullet. Alec Loorz’ impassioned speech tried to pinpoint why environmentalists and climate activists’ movement doesn’t seem to be working, or having the expected impact. He pointed to our change, centuries ago, from a hunter/gather society to one of agriculture. We domesticated nature and thereby distanced ourselves from it and tried to lord over it. He mentioned that we’re part of a universal system that every natural being abides. It’s time to let the laws of nature govern us and not the other way around. Happy reading and finding your way through the labyrinth! This entry was posted in Green Friends, Green Ideas, My CO2 Footprint and tagged Alec Loorz, climate clahnge, climate disruption, fossil fuels, Gain, Kathleen Dean Moore, labyrinth, Lifeblood, Matthew Huber, Moral Ground, Pen and Bell, Present Shock, Whidbey Institute, Wild Comfort. Bookmark the permalink.